Since most of my latest books are on my iPad (via the Nook library) I decided to show you my digital bookshelves. When I’m not reading fiction, I’m usually researching London or Chicago. In the case of the first two books, LONDON UNDER and LONDON: THE BIOGRAPHY) those are classic examples of the types of books I enjoy when I’m doing heavy duty research. From there we move into my collection of Ilona Andrews’ books. Ilona (along with her co-author and husband Gordon) write both urban fantasy (the Kate Daniels Series) and paranormal romance (The Edge Series). I’m totally hooked on these folks as their world-building and characterization is phenomenal. Their latest effort (GUNMETAL MAGIC) just came out and I’ve already read it. The next three books I haven’t read yet, but I will. In particular, the steampunk book looks fun. RANDOM REALITIES is an excellent short story collection by Melanie Fletcher, an author with a wicked sharp mind. I switch over to historical mystery with CHASING THE DEVIL’S TAIL by David Fulmer. Set in early twentieth century New Orleans, the book is full of jazz and murder. One of my all time faves is next: NEVERWHERE by Neil Gaiman. I’ve reread it countless times. Recently I’ve been conducting research into fairy tales so that’s why I have Brothers Grimm and FAIRY TALE RITUALS. Kim Harrison was one of my first urban fantasy authors and recently I’ve fallen in love with the Iron Druid Series by Kevin Hearne. Again, just to mix things up, THIEFTAKER by D. B. Jackson is a blend of historical and urban fantasy. I really enjoyed that book and will be rereading it in the future. Now we get into my shelf of US Demon Trappers books and my Time Rovers Series. I have them on my iPad in case I need to do readings and I don’t have a paper copy with me. And I admit, every now and then I go back and read them. The final bookcase has a couple of my books, a fantasy novel I haven’t read yet and then Anne Perry’s THE SHIFTING TIDE. Anne is one of the grand dames of English murder mysteries and I enjoy her books because they’re set in gritty Victorian London. THE SOURCE OF MAGIC is a delightful paranormal romance written by Cate Rowan and COVEN is by Tony Ruggerio, both friends of mine. Another friend’s novel (SHINE) is a young adult paranormal romance, part of a very readable trilogy by Jeri Smith Ready. And finally, 500 WAYS TO BE A BETTER WRITER by Chuck Wendig. It’s not politically correct in the least, but it’s got terrific advice for both new and established authors. So as you see, I’m an omnivore when it comes to books. If it intrigues me, I’ll read it. If I fall in love with the author, I buy all their books. Thanks Jana! I really need to read something by Neil Gaiman - everyone keeps telling me how great they are! You can read my reviews of the series so far here. (The link also takes you to an interview with Beck!) 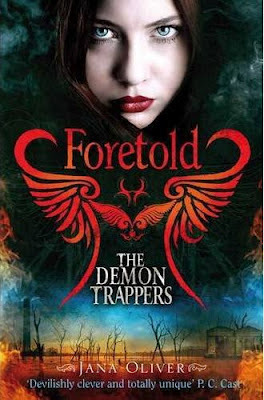 My review for Foretold will be posting later today - but in the meantime, I think I can safely say this was my favourite in the series! Make sure you check out the rest of the tour - the next stop is tomorrow at Reading a Little Bit of Everything.